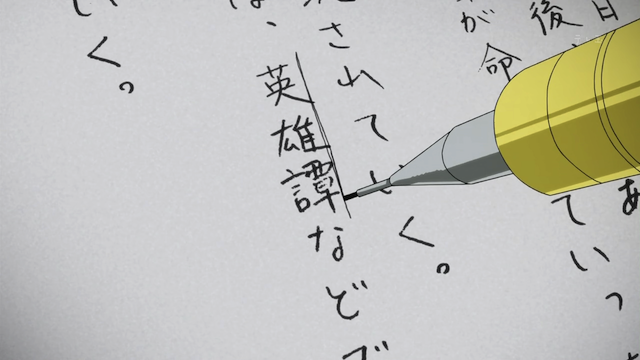 I seem to have gotten a different impression from Hyouka episode 4 than I have seen floating through the aniblogiverse. To jump straight to my conclusion: I think Oreki intentionally misled everyone for his own selfish reasons. The master schemer is scheming something. 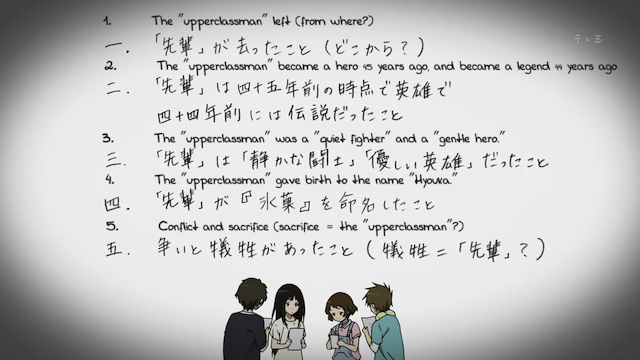 Right: Houtarou Oreki (the schemer). 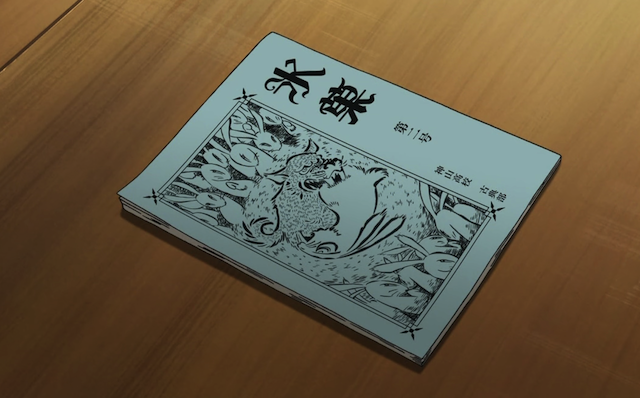 Left: Eru Chitanda (his mark). First, recall that Oreki has intentionally misled Chitanda before. 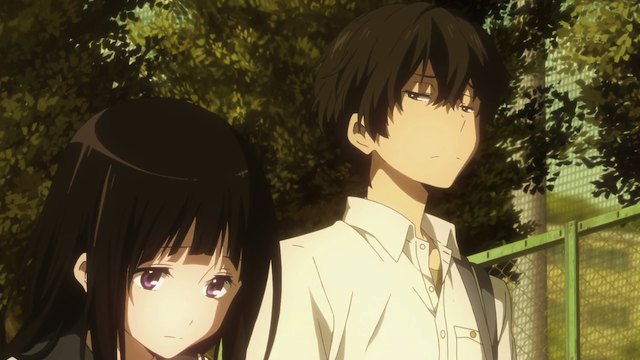 The mystery of the illegal club’s sign was pure fabrication that Oreki used to trick Chitanda so he would be able to head home without going to the music room. 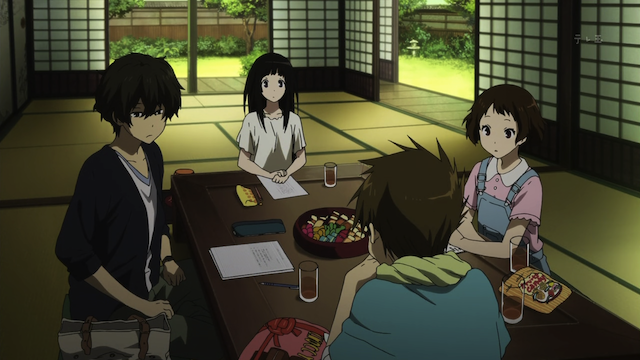 As this episode opens, we see Oreki manipulating Chitanda into letting the other club members do some of the research. He knows she doesn’t want to reveal her personal issue to the others, but he basically threatens her by saying, “Even if we can’t solve the mystery, sooner or later it will become a thing of the past.” Chitanda, who doesn’t want to lose this connection with her uncle, agrees to let Fukube and Ibara assist with the research. What follows is an interesting meeting in which the four share their research findings and offer theories they believe to be consistent with the existing information. Parenthetically, Chitanda lives in a beautiful mansion of traditional Japanese design. 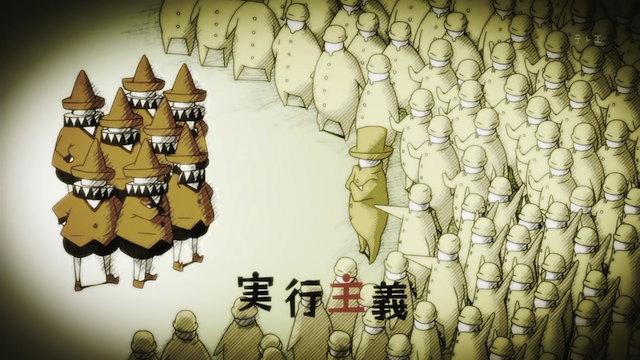 Chitanda’s uncle seems to have been a leader in a student rebellion during the 1960s. When it gets to be Oreki’s turn he realizes that he isn’t prepared to meet the expectations of the others. He did the minimum research possible, and didn’t prepare a hypothesis for discussion. His exact thoughts are, “I need a way out of this.” He excuses himself to the bathroom, and tries to think up a theory. When he returns he has a story that plausibly fits the facts as known (with one tiny inconsistency). It is my belief that he was not off trying to come up with a solution to Chitanda’s problem. He was trying to make up a story that satisfied the facts as they had discussed them that day, so that he could call it quits and go home. The fact that Chitanda’s childhood trauma is not explained is a good indication that there is something wrong with Oreki’s story. The fact that he didn’t take into account her tears upon hearing what her uncle said, is a pretty good indication that he is thinking less about Chitanda, and her need for a resolution to her childhood memory, than he is about his own desire to wrap things up. The cover of Hyouka volume 2. The cover of Hyouka volume 2 could well be a reference to the events of 1968. In the illustration, rabbits are standing around as a wolf kills one of their kind. The rabbits around the edge could possibly be the student body, and the rabbit being devoured is Chitanda’s uncle, Jun Sekitani. I am so very glad I’m not the only one to notice that. Oreki has demonstrated over and over again that ‘Doing as little as possible’ is more important than anything else, including accuracy and truth. He’s almost completely apathetic to everything, and I suspect that his sister is aware of it and is trying to keep him from becoming completely apathetic. There is one alternate interpretation that I can see and it’s based on speculation about the ‘Next Episode’ preview. In that, it shows him on the bike (obviously just after leaving) and he’s got his head down and his shoulders hunched, as if carrying a weight. It’s possible that he did discover the real reason Chitanda’s uncle was expelled and understood why child-Chitanda cried. He decided to withhold that information because he realized that he had pressured her into getting more help for a very personal issue and now he was faced with revealing that very personal side of the ‘mystery’ to everyone in the club, or editing the theory in such a way as to avoid that personal revelation. This, of course, assumes that he’s grown as a character from the ‘Secret Club’ farce he created. Moving on to the technical aspects, I’m just wowed by the animation. This is the KyoAni that did the school concert scene in Haruhi, the one that everyone expected to see in K-On! but never quite did. Just watch that bicycle ride. Especially the gear-shift! They didn’t have to do that, but they did and It Was Awesome. If SHAFT is minimal but effective animation, KyoAni is maximal but not overwhelming. If nothing else, this show amply demonstrates that KyoAni is among the top animators currently operational in Japan. First about the animation: yes, yes, yes. I could have gone on about this myself (there were great color choices to represent the varying light conditions, for example. The only reason I didn’t comment on this aspect is that once you start pointing out great artistic choices in Hyouka, there doesn’t seem to be a place to stop. The show is visually excellent. Now, about your alternate interpretation: what a great theory! If that is true, he certainly has grown more than I have given him credit for. Now I can’t wait to see what happens in the next episode to find out what really happens! Right now I’m just assuming he simply came up with the best solution that fit the facts as they have them regarding what happened to her uncle, and the others seemed to have decided that was The solution on their own. He realizes it’s probably not the the full story, but it did what he intended since, as you said, he really doesn’t want to put effort into this. Either way, I’m not sure their research into what happened to her uncle was directly intended to figure out what he said to make her cry – just a step along the way towards that end. If he does realize that it is not the complete solution and is holding that information back for reasons other than to protect Eru’s feelings (as Uldihaa has suggested), then I hope he is wracked with guilt. In my opinion, as the person who knows what is going on, he has an obligation to inform the others. He should not just decide that the truth doesn’t matter, and leave others to their misconceptions. Either way, it seems to me that Oreki’s personality is being developed quite deeply. I’m very interested to see how this plays out. That was actually a good observation. Oreki is an interesting character, he is smart but lazy, and he truly lives for his motto, so it wouldn’t be a surprise if he actually got everybody else to do the investigation for him. Though I don’t think he is as apathetic, only lazy, the “Average marks in every subject” line sounds like he only studied and answered enough questions to pass, which might be kind of scary. I won’t spoil anything of what happens after (the novels have been translated up to that point if you look for them) but I can say he is actually growing as a character and I’m finding myself enjoying this show more than expected. I think this is a pretty good show. It is obviously beautiful, but I mean the story and the characters are interesting. Even if Oreki is lazy, and ends up taking advantage of other people, I think he is an interesting character.